I have shared the photo above on this platform once before. I wrote a series of reflections on the village where that photo was taken, and today I share a riff on all that. That photo was enlarged to take up an entire wall of our office in India, as a reminder to me each day of the purpose behind what I was doing. Our company’s mission includes education. It is mostly about conservation. That building, which I photographed 10+ years ago, after it had recently been abandoned, has been a reminder for me that one of these days I am determined to share whatever I can from our work in that village. This photo was taken of Bangor Vamvakou immigrants in 1949 as they returned to their village. Top left is Nikos Niarchos, a relative of the Greek shipping tycoon. From Top Left, the others are: Vasso Anglesi; George Limberogiannis; Eleni Markos; Panayiotis Servetis; Vasso Kokini; Katsilis Demetrios and Anna Leakou. Middle Row, from Left: Pota Anglesi; Angeliki Skoufi; Eleni Hatzi and Panos Dialialis. At bottom, Left to Right, are Yiannis Limberogiannis and Harris Belbekis. The saying goes that it takes a village to raise a young person. But sometimes it takes young people to raise up a village, and this is exactly what’s happening in the Laconian village of Vamvakou. Vamvakou is a short drive from Vourthonia, my mother’s village. So this video below strikes a chord. Some of the images from Mamvakou could as easily have been taken in Vourthonia. Can a once-thriving mountain village, today home to only nine inhabitants, come to life again? Can it fill with visitors, permanent inhabitants, and model businesses while retaining its traditional character? This is the wager laid by a group of five young people who want to revitalize the village of Vamvakou, 900 meters up the slopes of Mount Parnon in the southeastern Peloponnese. Lotus flower seed heads and raw, un-puffed lotus seeds. When seeds first evolved, hundreds of millions of years ago, they not only revolutionized the plant world, but they also eventually sowed the path for human civilization. Today, it’s nearly impossible to eat a meal without consuming a plant embryo—or many. But how did seeds come to play such a critical role in human history? Why might one seed in particular, the lotus seed, hold the secret to immortality? And, perhaps just as importantly, how does this magical seed taste? Last week, we visited producers of various arts and crafts on the eastern side of Costa Rica. Our first stop was in the Central Valley, just before crossing over to the Caribbean slope, in a coffee shop. There, a man showed us his ceramic work, which we had seen one example of previously. All of it was beautiful, but the one below was the one we chose to purchase as a sample. And here it is, in the morning sun. It reminded me of the old documentary above, which I might have seen in 7th grade art class. In less than half an hour, that film clinically explains and demonstrates visually what goes into making something the traditional way. This man, here and now in Costa Rica, is hand-crafting these coffee makers. The material is organic, as is the design, which pays tribute to Costa Rican tradition, as well as to pre-Colombian indigenous tradition. The coffee seems to taste the better for it. A few years ago, almost by accident, Walter Crist happened upon one of the oldest board games in the world. Crist, who was then working toward a doctorate on ancient Cypriot board games, at Arizona State University, was searching the Internet for images of a game called Fifty-eight Holes. In the second millennium B.C., Fifty-eight Holes was the most popular game of its kind across Egypt, the eastern Mediterranean, and the Middle East, and roughly eighty boards of the game, in various degrees of incompleteness, rest in museum collections around the world. Images of these boards are well known to scholars, but the photo that Crist eventually found, on the Web site of a magazine called Azerbaijan International, was unfamiliar. Taken at an archaeological site near Baku, it showed a rock carving that bore a strong resemblance to the game’s board: two parallel rows of indentations and an outer, horseshoe-shaped run of more holes. It looked like a four-year-old’s sketch of a tree. The site, Crist learned, had been destroyed to make way for a housing development, but he eventually got in touch with an archaeologist in Azerbaijan’s Gobustan National Park, who told him that the park held a similar carving. “I think he knew that it was a game, or that people thought it was,” Crist said. “There were other people arguing that it could be an astronomical chart, or a calendar—but nobody that had studied games in any kind of depth.” So Crist decided to go to Gobustan and find out for himself. Kathryn Schulz came to my attention four years ago, and we immediately deemed her worthy of an invitation to Kerala. We linked to two more of her articles after that, but re-reading the first essay, it is easy to recall what “ignorance is bliss” means. The world was, as always, facing challenges. But I had no clue then what 2019 would look and feel like, so I enjoyed that essay differently then than I do now. Image credit: Efe/Gelede Mask, Yoruba Culture, Western Nigeria and Benin, Africa. Collection of Dileep and Martha Mehta. Aminata Konté, Kéréouane Village. Married at age 17Ami’s role with the Grandmother Project is to protect the young girls of her village. She sensitizes them to the dangers of early marriage and urges them to speak out if they don’t feel comfortable with the time that their parents want them to get married. She also explains and educates mothers on the dangers of female genital mutilation – a practice that has been a cultural tradition for centuries in Senegal. Once they identify that a young girl has a problem, the grandmothers of the community come together to discuss what to do as a group, and then confront the parents together. The parents rarely argue since elders are the most respected members of their community. Photograph by Tara Rice. The Ogelthorpe University Museum of Art is one of the gems of the Atlanta area, for good reason. Not only does the museum have its own well curated collections, it receives visiting collections that are timely and powerful. The photo series dovetails perfectly with the female centric collection of sculptures and masks in the sister exhibit, Stories Without an End. The exhibition Stories Without an End: Power, Beauty and Wisdom of Women in African Art of the Mehta Collection includes a selection of 50 classically carved wooden sculptures and masks drawn from the collection of Dileep and Martha Mehta. The exhibition represents art from more than 25 ethnic groups spanning 12 countries. These objects are gathered into thematic groups including women in governance, maternity, idealized beauty, and female ancestors. OUMA members Dileep and Martha Mehta are collectors of African and Asian arts. Their African art collection, including objects in this exhibit, has greatly benefited from diligent sourcing by and wise counsel of African Art dealers Tamba Kaba and Sanoussi Kalle. This exhibition was developed by Elizabeth H. Peterson, OUMA director, and organized by Amanda Hellman, PhD, curator of African art, Michael C. Carlos Museum, Emory University. Stories Without an End was inspired in part by the work of the Grandmother Project (GMP) an American 501(c)(3) nonprofit organization and a Senegalese NGO with representatives throughout the USA and abroad. GMP, with headquarters in Senegal, works with elders in West African villages to fight the maltreatment of young girls. This includes bettering maternal and child nutrition, reproductive health, and marriage standards. The exhibition title is inspired by the GMP initiative “stories without an ending,” which is a tool used to facilitate communication via the elders. For more about the Grandmother Project please visit www.grandmotherproject.org. Following on from beetroot burgers and jackfruit curries, the next star of the vegan “meat” world hails from the gardens of south-east Asia and looks somewhat like an artichoke. Banana blossom, also known as a “banana heart”, is a fleshy, purple-skinned flower, shaped like a tear, which grows at the end of a banana fruit cluster. Traditionally used in south-east Asian and Indian cooking, it can also be eaten raw and its chunky, flaky texture makes it an ideal substitute for fish. For the college-educated elite, work has morphed into a religious identity—promising transcendence and community, but failing to deliver. I had read the articles when they first were published, but did not put them into much perspective until listening to this conversation. I qualify as a workist. Work is not my religion, but the point is still well taken. This set of ideas is much bigger, and much more important than the experience of individuals; it is about how we organize for the future. This new discovery in Mexico’s Yucatán Peninsula came to our attention just when we’re on an archaeological roll. It definitely gives us pause that there are still such important finds in the world. In a cave under the ancient city of Chichén Itzá, Mexican archaeologists discovered a trove of ceramic artifacts that appear to be over 1,000 years old. Archaeologists announced this week that they had discovered an extraordinary trove of well-preserved Maya artifacts under the ancient city of Chichén Itzá in Mexico’s Yucatán Peninsula. The artifacts were found in a cave called Balamkú, less than two miles from the famed pyramid known as the Temple of Kukulcan, or The Castle, which sits in the center of the site. Guillermo de Anda, an investigator with the National Institute of Anthropology and History, said in a statement on Monday that the remarkable discovery could help researchers rewrite the history of Chichén Itzá, which flourished from roughly A.D. 750 to 1200. The city was built on top of a network of waterways, including sinkholes called cenotes, which the ancient Maya believed were sacred places that provided a portal to the underworld. Its name is sometimes translated as “the mouth of the well of the Itza,” the name of the main ethnic group in the area at the time. We’ve had friends and family members living in Atlanta for close to 30 years, and although I knew it was the hub of important aspects of American history, it never occurred to me to think of it in archaeological terms. At first consideration, I think about archaeology as the study of ancient cultures in far away places. Yet, with family in countries like Greece, I acknowledge that awesome layers of history can be just under the surface, or deeply buried and unearthed as cities grow with constructions of buildings and transit infrastructure. This piece in the Georgia State University Magazine made that quite clear. From its days as a railroad boomtown to Sherman’s tinderbox to one of America’s great cities, Atlanta’s history runs deep. The Phoenix Project, more than 100,000 artifacts collected by a team of Georgia State archaeologist in the 1970s, tells the city’s story through unearthed historical objects. There is buried treasure at Georgia State University. Stacked high and deep in more than 500 boxes stashed throughout the labyrinths of Kell Hall, more than 100,000 artifacts tell the story of Atlanta’s history. These boxes contain the lost pieces of a tumultuous past that dates to the city’s earliest days — bullet casings from the Civil War, mystery tonics in antique glass bottles, creepy toys, fashion accessories, ancient grooming tools and much more. Many of them still await examination and haven’t been opened since archaeologists first packed them four decades ago. This massive array of objects is called the Phoenix Project, and Georgia State professors and students have been methodically studying, cataloging and mapping each item since 2011. Collected all over the city between 1976 and 1980, the objects belong to the largest archeological collection ever associated with Atlanta. They are the fruit of one of America’s earliest urban archaeological projects — the roving excavation that followed construction crews as the Metropolitan Atlanta Rapid Transit Authority (MARTA) cleared land, leveled blocks and tunneled underground to build the first iteration of its rail system. Jeffrey Glover, associate professor of anthropology, has curated the Phoenix Project for years in hopes of providing the public with a different kind of city history, a slice of Atlanta’s past through the lens of historical objects. Catalog No. : P1848/170 Swamp Root Kidney, Liver and Bladder Cure, c. 1890, manufactured by Dr. Kilmer & Co., Binghamton, NY. Choosing one box among hundreds, Glover removes a small amber bottle that once held Valentine’s Meat Juice, a concentrated beef tonic from the 1870s. Advertisements said it could help with gastroenteritis, dysentery and even cholera. From another box, he takes out the misshapen head of a porcelain doll. Featuring dark, empty eye sockets and covered in burn marks, the scary toy looks hungry for souls. While Glover affectionately calls it the “creepy doll head,” its official artifact ID is “a3161,” written in impeccable script with archival ink across its neck. Just one of the standard cardboard bankers boxes can contain dozens, if not hundreds, of artifacts, each wrapped in brown paper and labeled with a unique artifact ID. Though they’ve all been recorded in a logbook alongside a one-line description, unwrapping each one is like opening a birthday present because you don’t know exactly what you’ll get. “It’s an excavation of boxes,” says Lori Thompson (M.A. ’16), assistant laboratory director at New South Associates. James Rebanks had come to my attention twice before. I found him compelling both times but because he was described in shorthand as the tweeting shepherd, my interest waned as quickly as it waxed. Now, after listening to him on a third occasion, and because of his music choices (on a show that illuminates a person beyond their words, through their musical taste), he won my attention back. Sustainability in both concept and practice has a long history in Scandinavian cultures in general, and Sweden in particular. As consumers become more conscious of the finite nature of materials, upcycling has to eventually be considered more mainstream. We applaud this type of public and private sector leadership that is the very definition of entrepreneurial conservation. Thanks to the BBC for this story. Anna Bergstrom had a dilemma. She loved the glitzy world of high fashion, but had also come to feel that it was unsustainable and bad for the planet. She’s now found peace of mind by running a stylish shopping mall in Sweden, where everything is second-hand. It’s very important to Anna that this place is enticing, because she feels it is making a statement. Everything for sale here, in 14 specialist shops covering everything from clothes to DIY tools, is recycled. She is usually turned off by the smell of second-hand stores, she explains, even though she adores vintage fashion. For most people flea-markets and charity shops carry a stigma, she thinks – a mark left by countless bad experiences. Too often they are worthy but depressing, Anna says. Her mission is to bring second-hand shopping into the mainstream. The mall itself is spacious and appealing, almost Ikea-like. An art installation – a tree and circular bench all fashioned from recycled materials – greets customers at the entrance. There is even a coffee shop and gift-wrapping service. The mall is called ReTuna. “Tuna” because that’s the nickname for the city where it is based – Eskilstuna, an hour’s train journey west of Stockholm – and “Re” because the goods on sale have been recycled or repurposed. In the interest of cutting back meat consumption, my eye is easily caught these days by pretty shiny things, like the image above, but even more so by rich description, especially when the history of a food is illuminated. This brief history of one root vegetable, accompanied by a couple of beautiful photos, led me to the book below right. Click the book image to go to the source. The Swiss botanist Gaspard Bauhin was born in Basel in 1560, and he dedicated his life to obsessively cataloguing the vegetable world. To present-day historians, he’s notable primarily for his botanical thesaurus “Pinax Theatri Botanici” (“An Illustrated Exposition of Plants”), published in 1623. But, among cooks, he’s sometimes recalled for his lesser work, published in 1620: “Prodromos Theatri Botanici” (“Prologue to the Exposition of Plants”), a compendium of flora in which he describes a plant with vivid yellow flowers, a spray of leaves, and massive, hairy roots “more or less similar to those of turnip or carrots.” It was a specimen that had never before appeared in any scientific list of plants: the rutabaga. Preparing ahead for a meal to be cooked today, I was reading this recipe, whose image (below) was competing for my attention with the image above. The picture above is eye-catching, at least to me, a visual cue leading me to the type of meal I should be thinking about more often. It is a big picture picture. I have red lentils in the cupboard, and I intend to prepare them today, so the recipe won the race for my attention. Melissa Clark’s red lentil soup.CreditJoseph De Leo for The New York Times. Food Stylist: Monica Pierini. What we eat – and how our food is produced – is becoming increasingly politicized. Why? More people are connecting the dots between diet and health – not just personal health, but also the health of the planet. And the central thesis that has emerged is this: If we eat less meat, it’s better for both. Helen Rosner, surprisingly appearing for only the second time in our pages, catches us just after our new year’s resolution to take up bread baking. The history of our work in Kerala, and specifically in Kochi, has long been intertwined with Art, and how the surrounding community interacts with it. Biennales, by nature, often blur the line between street art and gallery space, as multi-dimensional and multi-media installations begin to appear on walls, pop-up spaces, cavernous warehouse buildings, and classic museum halls. Now in it’s 4th edition, the Kochi-Muziris Biennale, has grown continually in both the breadth of the artists involved, and the depth of its work toward community outreach. This sense of inclusivity extends to gender equality, a longstanding issue that India as a country has battled with; the curator and more than half of the artists are female. As with the previous editions, the installations are thought provoking and moving, at times asking viewers to acknowledge and honor the difficult history of a colonial past. 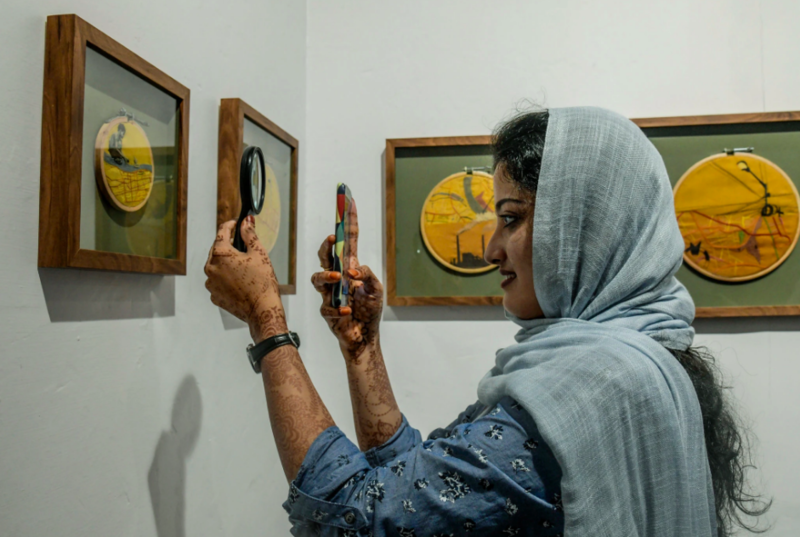 The Kochi-Muziris Biennale, South Asia’s biggest art show, uses interactive exhibits and live performances to help Indians connect with contemporary art. 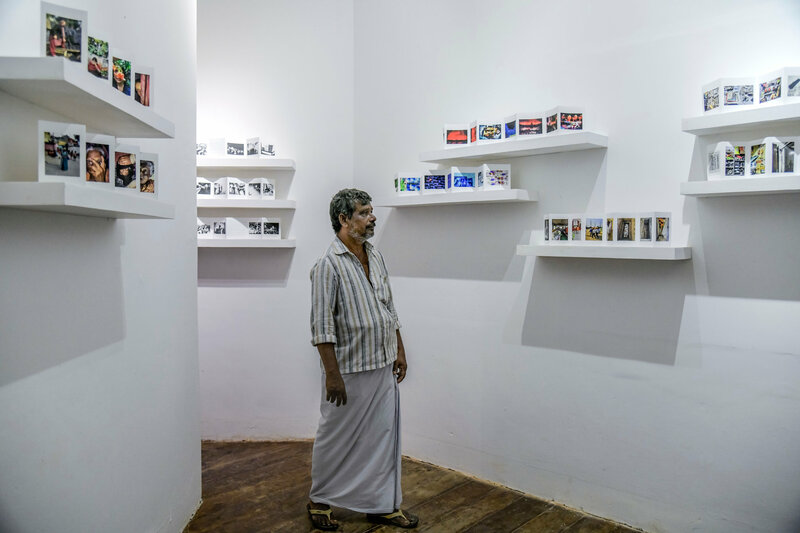 KOCHI, India — Clad in a simple striped shirt and the white mundu of the city’s fishmongers, Bashir stood out from the well-heeled throng at the warehouse galleries and tree-filled courtyards on the first day of India’s biggest contemporary art show, the Kochi-Muziris Biennale. Keeping to himself, he moved from room to room, stopping to study moody landscapes by the Delhi photographer Chandan Gomes that were paired with imaginary scenes drawn by a girl who died at age 12. Bashir’s willingness to engage with the artwork, no matter how challenging, was a victory for the show’s organizers. The southern state of Kerala, and India as a whole, have very few public venues to see art. So the organizers of the biennale, which runs until March 29, strove to create an event that would appeal to everyone — from untutored day laborers to veteran museum curators.